We can order this palette for you. Our shipments usually arrive around 11:00am on Tuesdays and Thursdays. 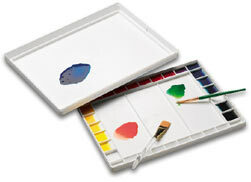 A favorite with the serious WaterColor Artist. The Aqua Pro is made from the highest quality injection molded resins. It is stain resistant and has the features artist demand.